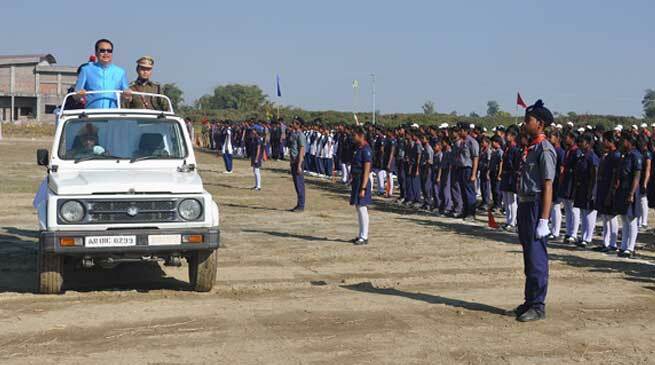 The 68th Republic Day was celebrated at Stadium Ground complex here on Thursday January 26 with patriotic fervour. Deputy Chief Minister Chowna Mein unfurled the National Flag and received the guard of honour. In his address, Chowna Mein paid homage to the freedom fighters, architect of the modern India, known and unknown freedom fighters and the brave soldiers who sacrificed their life for our future. He called upon the people to imbibe principles of non-violence and commit themselves to build the largest democratic republic of the world. He said that Namsai being a new district, it has some shortages & limitations to discharge its services to the expectation of the common masses but said that untiring efforts are on for transforming our district into fully functional one and to convert it into an epitome of Arunachal Pradesh. He also spoke on demonetization of high value currency notes of Rs 1000/- & Rs 500/- by the Govt of India which was done with a multifaceted aim for curbing black money, terrorism, counterfeit currency and corruption. He also informed that the Govt at the centre and in our state is encouraging digital transactions and moving toward a less cash economy. He said that NABARD has consented to adopt a village in our district for transforming it into complete cash less very soon. Digital Governance will be ensured in the state with 100% AADHAR with Direct Benefit Transfer including benefits under various welfare schemes. He urged the people who were left out to enroll themselves through the Biometric enrolment conducted by the Namsai District Administration and called to make Namsai, the first district to have 100% AADHAR. He also called upon the people to take active participation in “Swach Bharat Abhiyan” for clean and hygienic environment to in still the civic sense. He informed that the state government is actively considering for an alternative livelihood for poppy cultivator so that they abandon the cultivation of this poison for the society we live in. The government has also released required fund to make the defunct De-Addiction camp functional in State. He also said that the state govt is planning to provide an innovative budget for 2017-18 which would reflect the aspiration of the people. It would have priority for communication, Health, education, agri & allied sector, employment generation, entrepreneurship development with special focus on gender budgeting for women empowerment. He also informed that the state government is working with all the resources at its command to control the flood in Namsai and other flood prone districts. He appreciated the role of the District Administration, common people, Govt Departments, NDRF, Army, Paramilitary forces, numerous NGOs & social organization for their active involvement in rescue and relief operations. He informed that the plugging of breach point of Noa-Dihing River at Silatoo has been started with innovative technology and also construction of numbers of spurs on the bank of the river. He expressed hope that the perennial flood problem of the area would be mitigated. Further, the work of rehabilitation of displaced people is also in final shape. He called upon the people to pledge for making Arunachal and Namsai district a place where people live with happiness, dignity and self-respect. He also announced to provide ambulance in every district hospitals for better health care service.